News Article > No place like Holme! The 48-year-old, who works as a bailiff at French venue Dream Lakes, came back to home shores to spend a week fishing on Meadow Lake, at Holme Fen fishery in Cambridgeshire, and marked his return by taking a staggering hit of fish that included mirror carp weighing 40lb 2oz, 40lb 15oz, 44lb 4oz, 47lb 14oz, 48lb 12oz, 53lb 8oz and 54lb 14oz. All seven of the huge fish, plus a brace of twenties and thirties, came from a 12ft deep area at 110yds range, and fell to Mainline Salty Squid wafter boilies presented over a bed of new Mainline boilies that Dave was testing for the company. The secret to Dave’s haul was to keep things simple and to try to avoid making much disturbance, as he explained. 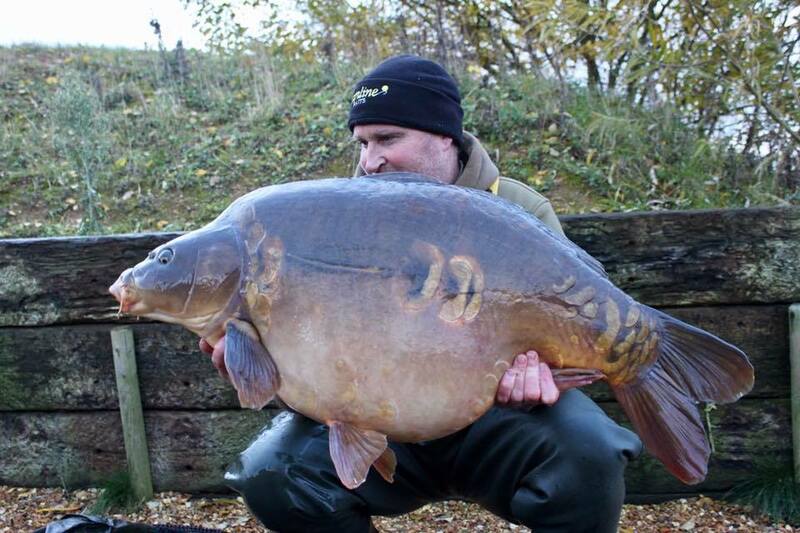 Dave kicked things off with a 35lb 8oz fish, with his next three fish out being the ‘48’, the ‘53’ and the ‘54’. He caught regularly over the next few days, and capped the haul off with the 44-pounder on the last morning of his stay. “All the fish scrapped like mad – I couldn’t believe how hard they fought. I was totally blown away by the session - what an amazing venue!” he added. We humans like to think we have a handle on the weather, but carp are in another league when it comes to making long-range forecasts. It happens every year: in the few weeks before the country is hit by sustained cold weather, carp go on a pre-winter feeding frenzy in anticipation of leaner times ahead, and over this past week exactly that scenario seems to have unfolded at venues up and down the country. As the reports on these pages testify, Dave’s remarkable haul is just one of a stunning array of big carp captures over the past seven days.